The Tipsy Baker: When will there be good news? The news has been relentlessly hideous. I’d feel like a simp if I launched into a chipper post about marrow bones and broccoli soup without at least mentioning how wrong and unstable everything feels, and by “everything” I mean Turkey, Orlando, Donald Trump rallies, bickering about bathrooms, shootings of civilians by cops, shootings of cops by civilians, inflammatory rhetoric on both the right and left, irritating smugness in certain quarters, intolerable racism in others, the stupid, stupid politics of sushi, self-pity, self-righteousness, speeches full of empty pieties, speeches full of utter nonsense and nauseating bigotry. Everything. And as I was writing this, Nice. Like a lot of people, I’ve been darkly obsessed with the news lately. Now, I shall proceed with the aforementioned chipper post about marrow bones and broccoli soup. *If you have only ever ordered marrow bones in restaurants, you need to try roasting them at home. Five bones made an easy, curiously luxurious meal for two and cost less than $5. I used the marrow bones prep method in Jennifer McLagan’s Bones: Soak the bones in water with 2 tablespoons of kosher salt for 24 hours. Change the water (and salt) every 6-8 hours. Pat bones dry. Salt and pepper. Roast on an oiled baking sheet at 450 degrees F for about 25 minutes. 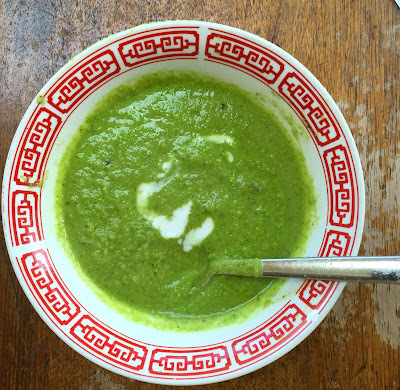 Serve with gremolata and crusty bread. Delicious. *The same day I bought the marrow bones, I also bought beef cheeks, which were also unbelievably cheap. I’d never seen them in their uncooked state and they really do look cheeky -- round, plump, red. The meat requires the same long, slow cooking as short ribs or chuck, but is softer, the shreds finer, the flavor subtly different. I used the cheeks to make these terrific rich, dark barbacoa beef cheek tacos from Food52. I used a guajillo pepper instead of the ancho (no reason, that’s just what I had), forgot the peanut butter, and recommend patting dry the cheeks before searing. Otherwise, I followed the recipe as written, including making the excellent pickled onion accompaniment. Highly recommend. 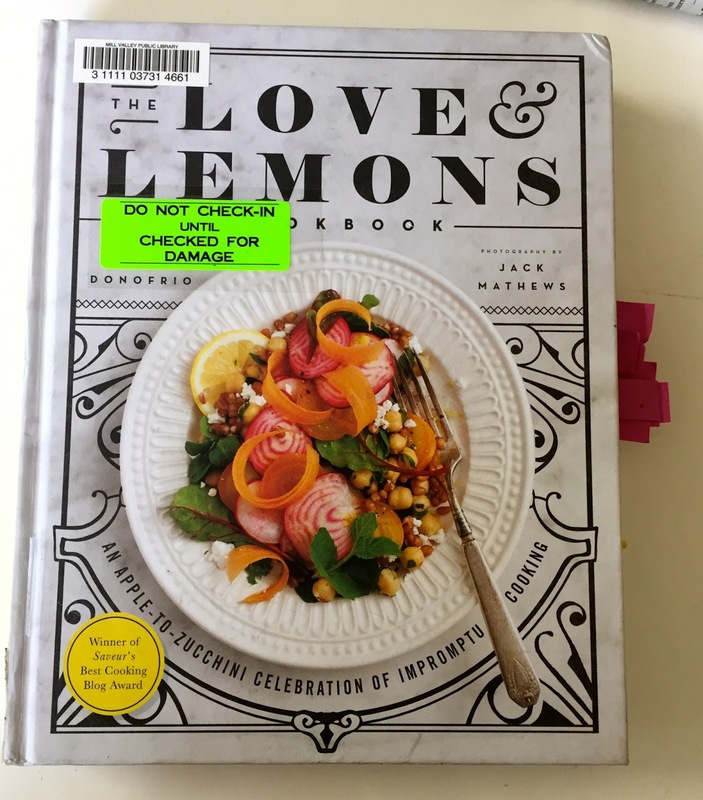 *Since that meat extravaganza, it’s been all vegetarian food from Love & Lemons, a book I will own in a few days if the librarian thinks it looks damaged. I’m afraid to say that the book might, to a very discerning eye, look damaged. I would probably say it looks gently used but will not argue if asked to replace it. I should have been more careful. While I don’t buy cookbooks anymore, I’d be happy to add this one to my collection. The dishes in Love & Lemons are great. I’ve liked everything I’ve tried, particularly the light, lovely chickpea- carrot ribbon tacos. I think of this as young people vegetarian food. Millennial vegetarian food. Love & Lemons is full of bowls, grains, nut milks, miso, lemon. Lots of mixing of raw and cooked ingredients, everything bright, breezy, and streamlined. I worked my way through the entire soup chapter of one of the Greens cookbooks (Baby Boomer/Gen X vegetarian) in the late 1990s and I would be chopping vegetables for hours to make one pot of soup. In Love & Lemons you cook a few vegetables quickly, puree them with nuts or miso or coconut milk, and you have dinner. 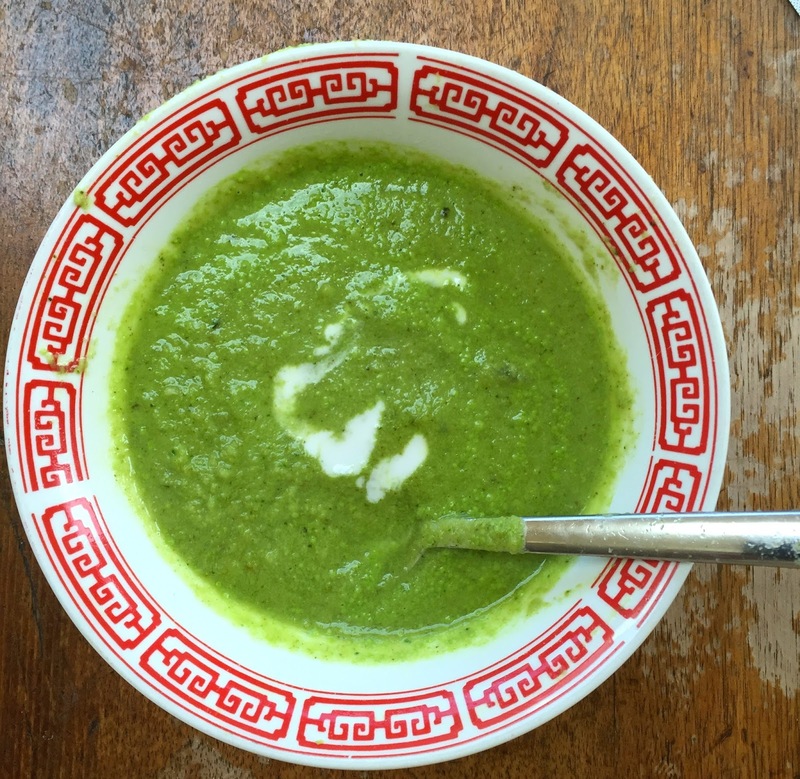 Here’s the recipe for a Love & Lemons broccoli-coconut soup that we liked a lot. I used an onion instead of a leek and chicken stock instead of vegetable, but if you follow the recipe exactly, it’s vegan. I’ve got a super-easy cauliflower soup in the works for tonight, freeing me up to spend even more time reading about current events and muttering to myself. I bought Love and Lemons after I saw it on your last post. It is beautiful. How can you not want to own such a book? Can you really walk away from buying cookbooks? I've been struggling with the news lately, too. Brexit, Baghdad, Dallas, Nice...it just doesn't seem to stop. My food refuge has been experimenting with sourdough. Thanks for the update -- I think we all come here for at least partly for a respite from the craziness and I am very grateful for it. You just casually drop that you no longer buy cookbooks?!?! I nearly choked on my toast. Tell us more. The bone marrow we had in Oakland was one of my favorite things I've eaten lately--perhaps I'll try it at home. Oh, yes, the news. It is even more important in times like these to attend to those everyday things that continue and make us feel more normal and "in control". Of course, we are not in control, but it is nice to have the illusion occasionally. So, thank you, Jennifer, for allowing us to think of other things. I really appreciate the diversion. I have never had marrow bones. I will have to investigate. It sounds like a spare dish, but I do love shanks and the silky sauce that devolves into mashed potato gravy for me. So, maybe I would love marrow bones. Beef cheeks actually sounds good. I just finished watching Marcella on Netflix. Highly recommend. Three days ago I was at an event where the national anthem was played. As I was singing, I got choked up and couldn't continue. What good do those lofty sentiments do for the victims in Orlando? For Michael Green, Alton Sterling, Philando Castile? And so many more. So ... yes, I needed this post, with your recognition of grim reality and also of the fact that we still need to eat, and nourish our selves, in face of all this. 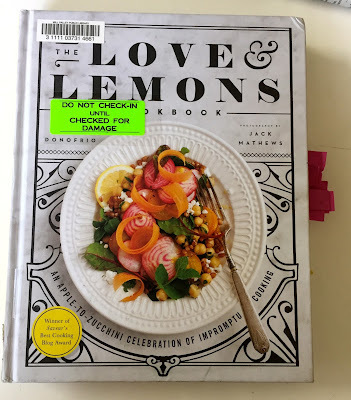 I beg you to share your method of storing your cookbooks, what you do with the new books that come out if you don't buy them, how you compile recipes you want to keep and store, etc? I would be spellbound. And yes, we all need to figure how how to do whatever we can as single human beings to refuse to be any part of the madness that is our world. I would like to echo Beckster's wise comment about thec reassurance one can feel from doing simple daily chore (for me, washing dishes seems so therapeutic!). 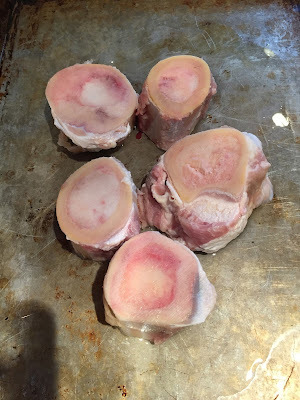 Also, Jennifer, your post about marrow bones brings back childhood memories of how during the starving times in Europe during and following Wxorld War 2, my father made beef soup with bones that had scant meat on them, but still simmered into a delicious broth that helped sustain us for days. The marrow was a luxurious treasure, spread on bread. This soup helped to keep us alive until we were able, after a 5-year wait ti immigrate to America. In Vermont, my father still made soup, with bones that actually had some meat on them. It was delicious.